Good eating habits are crucial to nourishing and restoring your body, but sticking to a clean eating plan isn’t always easy! Foods loaded with fat, sugar, salt, and additives are appealing and addictive. 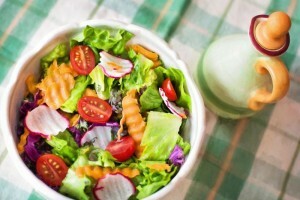 Here are a few tips to stick to a healthy diet. Don’t plan on cutting out sugar or wheat from your diet all at once. Instead, set achievable goals to slowly taper off. This will give you time to figure out which alternative options work best for you and allow your body to adjust without going in to shock. Research has shown that when you make both dietary and physical activity changes at the same time, the results tend to reinforce each other. It will be difficult to stick to your diet if you are always surrounded by junk foods. Remove them from the house, or keep them out of sight if household members want to keep these foods. Keep a food journal until healthy eating habits are established. It will help you to make better choices and figure out which foods may be causing negative reactions. It can be tough to create new, healthy habits on your own. Having a diet or exercise buddy my be helpful, especially if that person is your partner or spouse. Everybody is different – there is no perfect roadmap to achieving healthy eating habits. Use your food journal to analyze your successes and mishaps and determine what works best for you. Click here for tips to eat healthy when dining out.